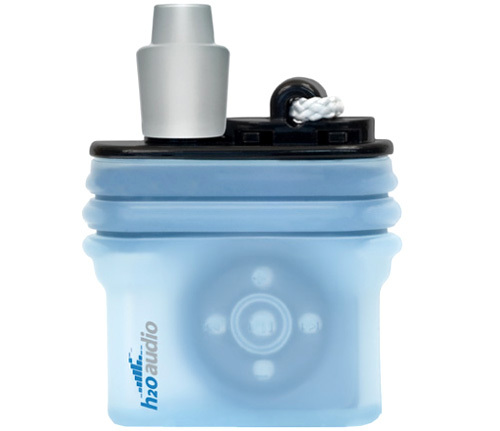 H20Audio iPod Shuffle Waterproof Case | OhGizmo! By Andrew Liszewski on 04/22/08 • Leave a comment! For some people the Summer means long hours spent in a pool, lake or other equally refreshing body of water. But if you wanted to enjoy your music at the same time, it usually means settling for a splash proof radio sitting at the water’s edge. Lame! Instead, you might want to consider this waterproof case that will allow you to take your iPod Shuffle underwater with you. The case will protect the Shuffle to depths of about 10 feet, while still allowing you to push the volume and playback controls, even if you’re wearing a glove. The H20Audio waterproof case also includes an armband which will keep your hands free for swimming or fighting off sharks, and there’s even a belt accessory if you wanted to go that route instead. The case is available from iPodWorld for about $60, but to ensure it remains completely watertight you need to use it with a set of headphones attached. And since it’s designed to be used underwater, you’ll also need to make sure those headphones are waterproof too, which will add to the cost. ← Pet’s Eye View Camera – Oh Where, Oh Where Has Your Little Dog Gone?